9:30 – 10:30 AM: Have No Fear, Spring Is Nearly Here! Virtual Farm Tour with Stu Nunnery from RICAPE. Site Assessment for Farmers – Stu Nunnery (RICAPE) will discuss the tool developed by New England Farmways to help farmers determine if their land has potential as a farm destination. Whether you’re starting out, seeking to expand, or simply need a fresh set of eyes to look at your existing operation, A farm site assesment can promise a cost effective process to help you identify and/or customize your revenue-generating products, activities and amenities and the resources you’ll need to get you where you’re going. Easy Beans, Blog 101 – Hi there! We are Annie and Connie, twins at Brown University who love food. We were inspired by Brown students who created mouth-watering food concoctions in the Ratty from ordinary ingredients, so we started a blog called Ratty Gourmet to showcase recipes using ingredients that can be found in our college cafeteria. We're here to show you how easy it is to start your own blog on any topic that you feel passionately about! 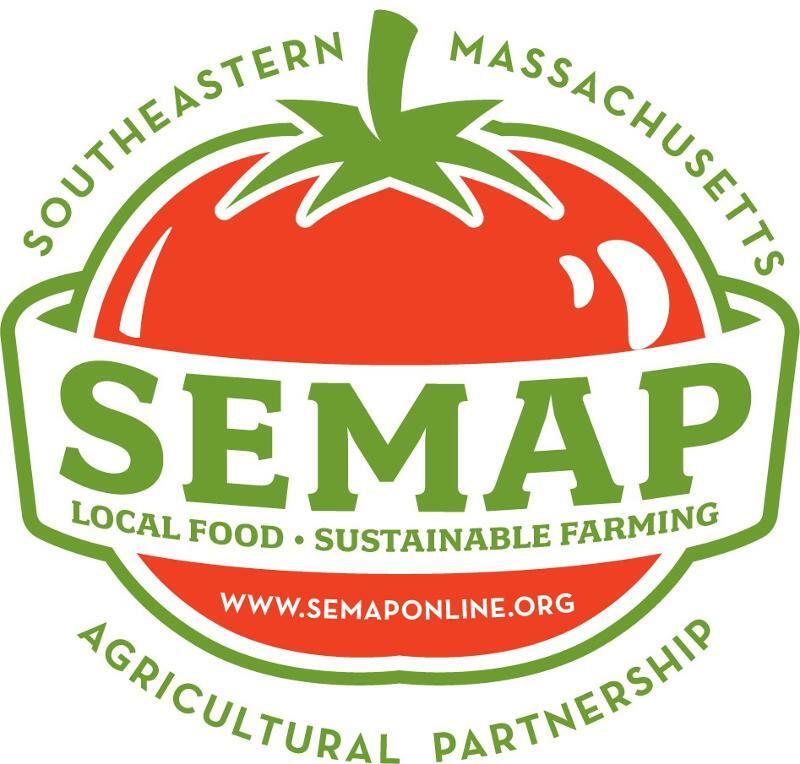 Eating Local 101 – Discussion with Sarah Cogswell (SEMAP) will discuss the Why, Where, & How of local food. The importance of supporting local and the impact local farms have on our economy. 12:00 – 1:30 PM: Lunch Prepared by Mike Melo of M&C Café, New Bedford. 12:00 – 1:30 PM: Resource Fair and Grant Room: Get your questions answered and learn about new offerings from exhibitors. Massachusetts Farm Bureau Federation, INC.; Farm Credit East; Munroe Feed & Supply; Fieldworks; Dole & Bailey ; the trustees of reservations ; Wildlands Trust ; Farm Service Agency; Padula Brothers; Kettle Pond Farm; NOFA/Mass; Aerostar, Inc; NRCS; Tractor Supply Co.
Value Added – Panel Discussion with Drew Poce (Nantucket Wild Gourmet & Smokehouse), Cyndi Jacobs (Dartmouth Grange), Michael Melo, (M&C Cafe' and Catering), and Greg Morton (Morton's Fork Catering). Down & Dirty With Your Local Land Trust – Panel Discussion facilitated by Katie Cavanagh (SEMAP), Jennifer Dubois (The Trustees of Reservations), Sue Guiducci (Dartmouth Ag. Com). Meet Me At The Farmers Market! – Panel Discussion facilitated Barbara Anglin (Plymouth Farmers' Market) with Martha Stone (a seasoned, seasonal cook and savvy market shopper), Dave Purpura (Plato’s Harvest Farm, Middleboro), Donna Blischke (Web of Life Farm, Carver), and Melissa Colangelo (co-manager at Plymouth Farmers’ Market). So, why are farmers' markets good for farmers, for the community and overall for the local food movement? "Meet Me at the Farmers' Market” will address these questions and offer pragmatic tips on how to navigate a farmers’ market, how to stretch dollars while shopping at your local market and how to best eat seasonally while supporting local farms. Commonwealth Quality Program - Michael Botelho from will discuss MDAR’s new Commonwealth Quality Program. Commonwealth Quality, a brand designed by the Massachusetts Department of Agricultural Resources, serves to identify locally sourced products that are grown, harvested and processed right here in Massachusetts using practices that are safe, sustainable and don’t harm the environment. Fertilization Calibration: 1 Pesticide Credit – Rich Bonanno will discuss equipment, spreading manure, compost, and granulated fertilizer. Also, crop needs and how to put together a nutrient budget. Some written information from the New England Vegetable Management Guide will be handed out. Birds & the Bees – Everett Zurlinden (Beehavin’ Apiary) and Alex MacDonald (MDAR) Have you ever wanted to raise bees or birds in your backyard but did not know where to begin or where to find information? This workshop will discuss all the basics and show you where to get information and regulations specific to your town.